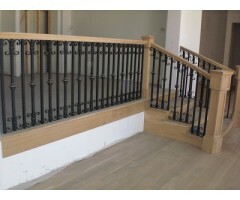 Each baluster on this stair rail was attached to the stair treads verses having a bottom rail. 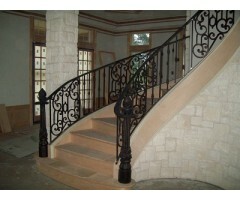 Two double twist bars and a double twist butterfly is the pattern topped off with a molded forged steel handrail. 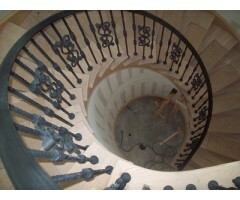 ..
Scroll panels with a center medallion give this curved stair a beautiful appeal. .. Hammered square bar banded with c-scrolls as a top and bottom design with large square collars in the center for symmetry. ..
Elliptical stair rail using alternate scrolls with double and single decorative bars all mounted to the tops of each stair tread with a decorative round shoe. ..
Scroll panels interspersed with ribbon twists alternating between single and doubles with a decorative baluster using two c-scrolls back to back creating a butterfly effect. ..
Large fluted cast iron posts on the starter steps with the scrolled ironwork beautifully curving up the centerpiece elliptical stairway. .. 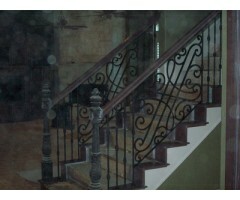 This mosaic ironwork design is a conversational work of art for this contemporary home. .. 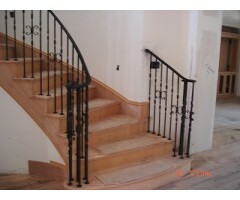 This stair rail consists of alternating square and twisted bars on a full rail, with a single hand rail on the wall. .. 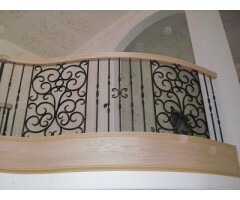 This stair rail is unique in that the bars are attached to the tops of the stair treads and topped with a decorative shoe, while the decorative panel is attached to the balusters on either side creating a beautiful effect. .. This stair rail was created with wide decorative scrolled centered panels and balusters all mounted on a top hand rail and bottom rail. 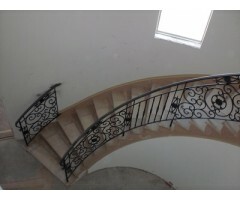 ..
Closed end staircase with a combination of scroll panels and baluster patterns to create an ornate design with the iron attached to a wood handrail and bottom rail. .. This ornate custom rail was built with an extreme handrail and dressed to impress with contrasted silver accents of ribbon woven through the design of leaf tipped scrolls. The spectacular barrel volutes can be seen under photo ST-026. ..